Once a year we look back at what the past year has brought us, both ups and downs. We usually discover we've accomplished a whole lot more than we thought. That helps us make plans for the future. The living room was warmer and lighter after the bay window was built. Our winter house project was the front porch, which by January meant replacing the old living room windows. In their place, Dan built a bay window. 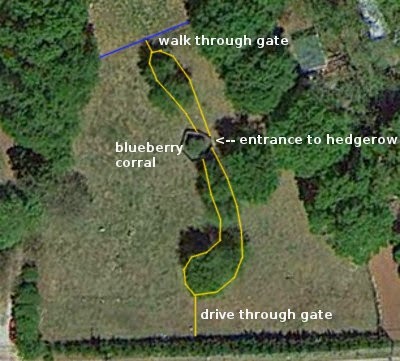 It was the month we lost Gruffy, and it was the month I started planning our first forest garden hedgerow. The hedgerow now divides our front one acre pasture into two sections. In February we got to work on that hedgerow. It was also the month we chose to be roosterless for awhile, never suspecting we'd have a volunteer day rooster ready to take over the job. In March my first Kinder kids were born - quadruplets. We got the hedgerow fenced and gated, and planted. Our indoor project of the month was finishing the window seat for the bay window. Our first hive of bees. This was bee month. We assembled our hive kit, painted and named it, set it up, and installed a 3# package of honeybees. We also had our year's second goat kidding - a pair of twin doelings. In May one of my Buff Orpington hens went broody. Dan and I were wanting to try something new, so I ordered 16 Black Australorp chicks for my broody to adopt. Mrs. Broody and I had a battle of the wills in regards to her nest location, until she finally said, "Forget it." That meant hand raising the new chicks with no mama. Subject to much speculation was whether or not Polly Pig was pregnant. It was also the month our walk-behind tractor died. Two of my new doelings with one of my home-born girls. June brought a hot start to summer. I worked in the garden and fussed with my bees. The big news was expanding my little Kinder herd with three new doelings from Illinois. I had plenty of milk coming in and resumed mozzarella making. Polly surprised us with six piglets in July. I hadn't even been sure she was pregnant. We worked on the house some, getting another new window installed plus trimming out the new front door. The big news was that we bought a farm tractor! Dan's big project in August was making a goat feed chopper out of our old yard mulcher. He also finished the living room so that we could use it again. In critter news it was the month Valentine (aka Meowy) came to live with us, and I traded one of Polly's piglets for six Muscovy ducks. It was a busy month in the garden: summer garden harvest, planting the fall garden, and starting on a hoop house. In all his spare time, Dan also made a little progress on the front porch. Our pullets started laying just in time for a winter egg supply. October is the month we get ready for winter. Firsts included Australorp eggs, raccoon stew, and a new method for planting winter pasture. I had just read Masanobu Fukuoka's The One-Straw Revolution was able to modify one of his techniques. First frost came in November so it was the month of finishing the summer harvest. It was a very rainy month so little got done outside. I spent my days trying to get Critter Tales ready for print, so I didn't do much blogging. Dining room windows are in and needing trim (both inside and out). In early December I was finally able to announce the release of Critter Tales and hold a giveaway to celebrate. During the month's first cold rainy days I cleaned out the freezer and worked on jams, jellies, and pizza sauce. Warm days followed, and when it wasn't raining we were able to make much progress on replacing our dining room windows. And that's been our year! How about you? It's been so rainy for the past two months that I haven't worked in the garden as much as I usually do. But it's doing fairly well in spite of that. Carrots & Garlic. We're getting the best carrots this year ever. Dan added sand to the bed which seems to have helped a lot. are starting to die back. But they still make good goat and pig food. pollen. The young tender leaves are good in salads too. Heading collards. The warm days mean other insect activity too! I have a few beets in this bed as well, but they didn't germinate well. feed them whole to the pigs. Goats get chopped radish greens as well. well. I've just started thinning and mulching the bed. trimmed back all the wire grass and will mulch well. kale, broccoli, cabbage, arugula, spinach, lettuce, and radishes growing. The broccoli is starting to form heads. arugula, cabbage, beets, radishes, and spinach. Some of the above seeds are new to me thanks to Eliot Coleman's Four-Season Harvest and The Winter Harvest Handbook. He gardens year around in Maine! I'm much farther south and have had some successful winter gardens in mild years, but not so much in an extremely cold or snowy winter. One thing I realized from reading his books is that I'm usually focusing on slow-bolting, heat- and drought-tolerant varieties. For a winter harvest, I need to focus on cold-tolerant varieties. It's a new way of thinking for this southern gardener. That's it for my December garden tour. How about you? The other evening I was finishing up my shower when I heard Riley meowing loudly in the hallway. I knew what he wanted - to go outside. "Well," I thought, "he's just going to have to wait." Next I heard pushing on the bathroom door. Because our master bathroom is so small, we installed a bi-fold door when we remodeled it. Riley knew that if he pushed on the center of the door, he could get it open! He peeked in once to see what I was doing, then proceeded to push it open more and let himself in. The meowing didn't let up until he finally got what he wanted. One of Dan's favorite accompaniments to turkey is cranberry jelly. I've tried homemade recipes for cranberry relish, but he prefers the non-chunky jellied kind, so every year a can of cranberry jelly is on my Thanksgiving shopping list. This year I had trouble finding it without high fructose corn syrup, and that particular ingredient is on my list of non-negotiables. If the label lists HFCS as one of the ingredients, I don't buy it. If I can't find the product without it, I do without. But how could I not have one of my Beloved's favorite Thanksgiving foods? The obvious answer - make my own! Cranberry jelly is so simple to make that I now wonder why I haven't been doing it all along. Combine, simmer until the cranberries are tender, and run it through the Foley food mill. That's it. Some recipes call for the addition of gelatin, but I chose the simpler, 3-ingredient version. The result was a thick, not too sweet, delightfully cranberry flavored sauce. Better than the canned stuff! And it made plenty. Dan commented that it reminded him of jelly donuts, so the following Sunday we had cranberry jelly rolls for brunch. the buns with jelly, and dipped each in a powdered sugar/milk glaze. Our traditional Christmas breakfast has always been Scotch eggs with English muffins and cinnamon butter. These jelly rolls could easily replace the English muffins! That only used up part of the jelly. Plus I had saved the cranberry pulp from the Foley, so I decided to make a sweet potato cranberry cake and use the rest of the sauce as a topping. Cranberry sauce topping a slice of sweet potato cranberry cake. Cream sugar and butter, add eggs, vanilla, sweet potatoes, and then your dash of sour (to interact with the baking soda). Combine dry ingredients, add them to you creamed mixture and mix well. Bake in greased and floured bundt pan at 325° for 45 minutes to an hour (or until done). I usually make cakes without frosting, except for birthdays. The sauce was a nice not-too-sweet topping for a holiday style dessert. What foods make the holidays for you? Do you every experiment with others or upgrade the traditional recipes? Please share yours! We all love good recipes. In my first post about this project (here), we left off puzzling over how we were going to install those odd-shaped windows. opening in the wall is wider than the new window. They're going to go on either side of the old dining room chimney. have cost more money and time than we wanted to spend. Removing the old window was the easy part. This was the very first window we've replaced that actually had a header! We replaced eight windows prior to this one, and every single one was simply stuck into a hole in the siding and nailed in place. Old siding + stud + drywall + cement board = 5.25"
On top of that, we were adding 1/2" siding panels. I've mentioned that the dining (and living) room walls are cement board. The builder nailed them to strips (not sheets) of drywall. None of that is coming down, and neither is the original wood exterior. We've been adding our new siding on top of that. Tar paper and siding covering the window opening. After cutting out the opening, Dan built the casing. He made his own sill. Something to nail the moulding to when we get to it. First set of windows are in! The first week of December was cold and rainy in our neck of the woods, so I decided it was time to clean out the freezer. This is an annual late fall/early winter project for me, because I've been tossing fruits, tomatoes, and bones into it all summer long. Once the harvest is over, I can begin to process all of these into jams, jellies, and sauces. Their destination is elderberry jelly. I tried making an elderberry pie last summer, but we did not like it! The seeds totally ruined it. But the pigs loved it, so there was no waste. That was my clue to stick to elderberry jelly and never mind trying jam. I'm going to include the recipe here because it isn't in my Ball Blue Book or the boxed pectin directions. If it's here, I can add it to my recipe page and always know where to find it. Combine juices. Mix pectin with about 1/4 cup sugar and mix into juice. Bring to a boil. Add sugar and bring to a boil again. Pour into sterile half-pint jelly jars, cap, and process in boiling water bath for 5 minutes. NOTE: My favorite pectin to use is Pomona's Universal Pectin, but it's not easy for me to get at a decent price. My frugal side decided to try bulk pectin. It was still pricey and I still prefer Pomona, although next year I'm hoping my crab apple tree will finally produce enough that I can start making my own. Next I got out a gallon bag of my frozen figs. With these I wanted to make a fig and orange jam. Earlier this year I made a fig jam and used orange juice to replace the water needed to make 5 cups. It was really good, but I thought real oranges would be even better. Combine figs, orange, lemon juice, and water. Simmer until the orange peel is tender. Meanwhile mix pectin with about 1/4 cup sugar. Stir pectin and cinnamon into the figs and bring to a boil. Add sugar and bring to a boil again. Pour into sterile pint jars, cap, and process in boiling water bath for 15 minutes. Lastly, I got out my frozen tomatoes to make sauce. While I was digging around in the freezer I found a half-gallon of broth from cooking chicken. What better thing for lunch on a dreary, drizzly day than Thanksgiving leftover Scrap Soup. I used chopped garden arugula for the greens and it was pretty tasty. The soup was so good that it got me started on making more soup to can. Home-canned soup is one of my favorite convenience foods. So I got the fridge cleared out as well as most of the freezer. It's nice having a productive day like that. For everyone who entered, I want to offer a discount code for 30% off Critter Tales at my CreateSpace eStore. That's for as many copies as you'd like. Click here, and enter the code JB4XPZG4 (expired) at checkout. More and more worldwide sales outlets are becoming available: click here for the latest links. And of course I want to thank everyone who entered the giveaway, with hugs and kisses for everyone who helped me promote my new book. Self-published authors are sort of the renegades of the publishing world, which means there's no help in promoting our work except what we do ourselves. The beauty of self-publishing is that it means that anyone with something to say is free to say it without the acceptance and approval of the publishing industry. If you support this freedom and read a good independently published book, pass the word on to others. One of the best ways to do this is through reviews at the online sellers' websites. Amazon, of course, is the big one, but others offer this feature as well. Another way is to do book reviews on your blog. Word of mouth is any author's best friend. If you do a book review on your blog after you've read Critter Tales, let me know and I'll start a "What Readers are Saying" on it's webpage, with a link to your review. Writing books is my way of helping support our homestead. My wildest dream is that I might someday be able to make enough of a living from it for Dan to not have to go out over the road anymore. The reality of homesteading is that it's nearly impossible to do full time without some other means of income. I'm sure most of you can relate, which brings me to "an Opportunity for You." The Opportunity is to become an affiliate in a project I'm involved in. The Homestead Bloggers Network is producing a Back to Basics Living eBook box set containing eBooks by 70 homestead authors, including myself. I've created an exclusive "Back to Basics Living Mini-Bundle" from four of my The Little Series of Homestead How-Tos. I've never participated in anything like this before, but the gist of it is that anyone, participating author or not, can earn money as an affiliate in this project by advertising the box set on their blog or website. HBN is paying a 40% commission on every bundle sold. The only caveat is that you must have your own blog or website. Click here for more details and to sign up. Please put my name in the "Who Referred You" field on the sign-up. Sales start January 18, 2016. 2016! Can you believe it's right around the corner? So much to do to give 2015 a proper send-off. I'd better get to it. I can't tell you how pleased I am to announce that it's finally in print! 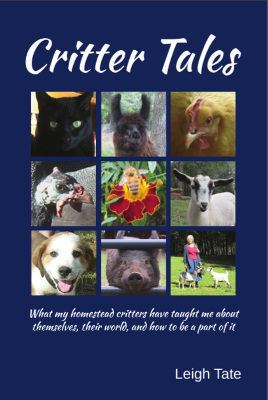 The official blurb: "Critter Tales is a book for everyone who is interested in farm life, farm animals, and especially in homesteading with farm animals. Each section begins with the author's careful research into the needs and care of various kinds of livestock: chickens, goats, llamas, livestock guardian dogs, guinea fowl, farm cats, pigs, and honeybees. The tales which follow describe real-life learning about those animals: opinionated chickens, goat drama, critters that won't stay put, mysterious deaths, choosing the right breeds, the population dilemma, dealing with predators, and how the animals themselves don't always agree with "the experts." The sections conclude by discussing how each critter fits into the author's primary homestead goal of self-reliance and sustainability. Includes 92 tales, 216 photos, a list of resources, and an extensive index." To celebrate, I'm hosting a worldwide giveaway for a copy of the book. Anyone, anywhere, can enter. Just leave a comment and you're entered. But also, I need help to spread the word because self-published books need self-promoting. You can earn extra entries by giving Critter Tales a shout-out on your blog, website, or favorite social media. Share this announcement and giveaway on your blog or website for 3 entries. Share it through any social media for 1 entry each. To claim your extra entries, leave me a comment with a link to your share. If you'd like to use a copy of the cover, click here. ISBN 978-0-9897111-2-8, 6" by 9", 388 pages, list price $14.95. More worldwide options will be available soon. Winner will be announced one week from today.